Written by Shayla Price on January 23, 2018 . Payment collection is rooted in ancient civilization. The first known handwritten document in Great Britain is an invoice that dates back to 57 AD. An invoice dating to the first decade of Roman rule. [Source] Sophie Jackson, a member of the Museum of London Archaeology team, told Culture 24, “It’s essentially one merchant asking to be paid 105 denarii for goods delivered.” And while a lot has changed in how we communicate about accounts receivable, the basic notification to inform our customers hasn’t. Today, dunning emails strike the same balance of firmness and tact that wooden tablets did. And the stakes are just as high! When a customer’s credit card fails or expires, they might not even know it. But your business notices the revenue loss. Dunning messages minimize that risk. These transactional emails remind customers of what they love about your product and why it’s worth updating their payment methods. Let’s take a deep dive into how a dunning email strategy can reduce delinquent churn and get your customers back on track. Ready to improve your retention and revenue? Click here to grab a free ebook! Pre-dunning 1: Customer enters the delinquency segment with one month until expiry. The first dunning email is triggered. Takes no action and remains in segment. Pre-dunning 2: The next email is triggered a week before expiry. Dunning: The third email will arrive on the day of expiry. 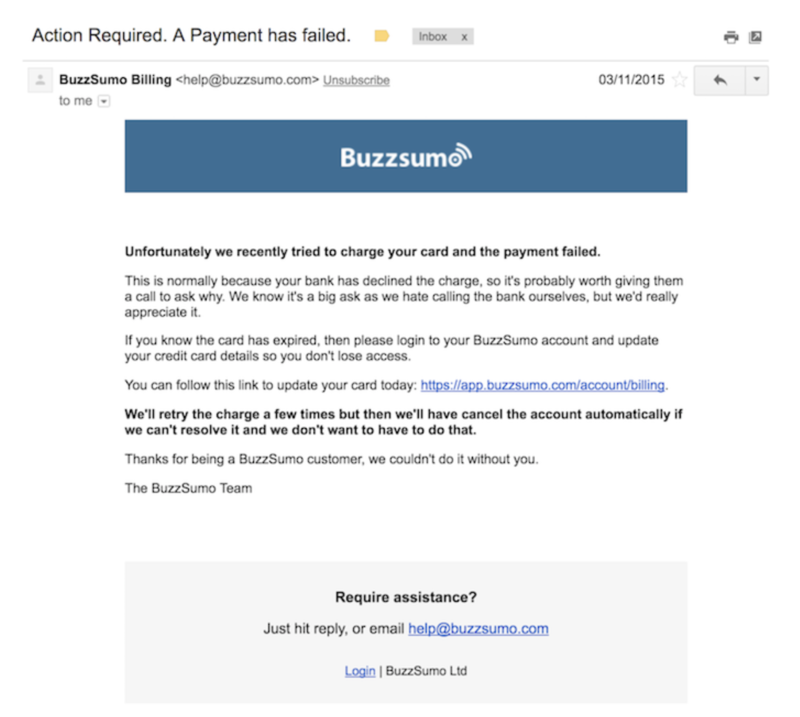 Post-dunning: A final email is sent a few days after expiry (with a warning that the customer’s account will be deactivated due to credit card failure). Let’s say you take the timestamp tracking route. You would create a segment with users whose credit cards expire within 30 days. The data would appear as an attribute in Unix timestamp. Then, you would create a segment triggered campaign. Be sure to create a workflow with emails and a timeframe that matches your audience’s behaviors. To ensure users only receive the dunning emails if they remain in your segment, use the settings below in the Goal & Exit section. Once users update their credit card information, they will exit the campaign. (Click here to learn how to send API calls to update customer profile data.) If you want the campaign to work more than once–multiple card expiries by the same person, you’d need to make it re-enterable. Reach out to our friendly support team for assistance on that process. And while it may seem like a lot of prodding, people actually respond to multiple reminders better than a single warning. A Harvard Business School study found that “redundant communication, coupled with an escalating sense of urgency, is integral to communicating because it gets the job done.” The same study also mentioned that people respond better to reminders in various communication formats. So while you may prefer to send these transactional emails, consider other multi-channel options, like SMS, push notifications, or in-app messaging. The copy of a dunning email is relentlessly focused on a single goal: getting customers to the billing page. The key is to keep the customers’ needs in mind. 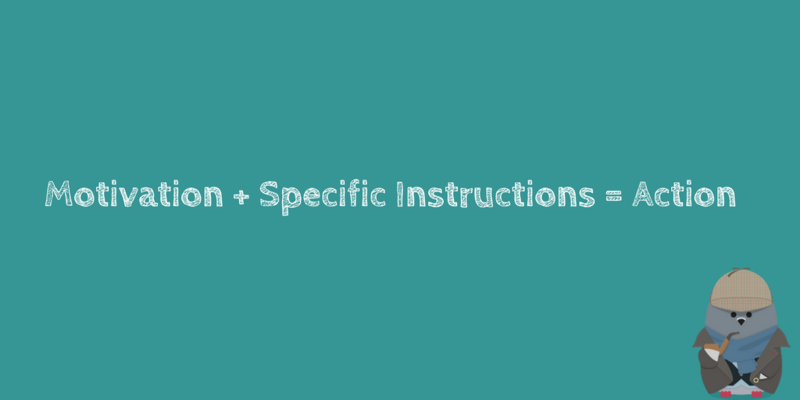 Leading up to the call to action, you can use copy to demonstrate your value to the customer. 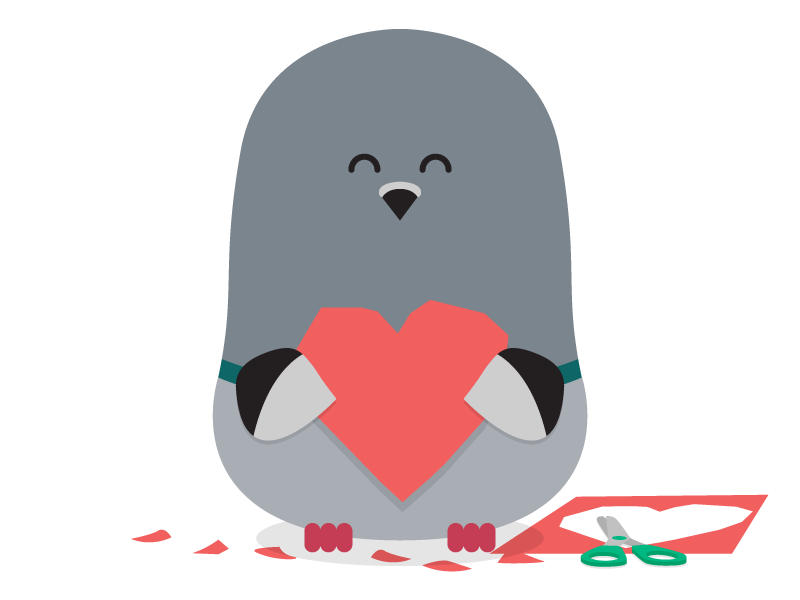 Rather than sending a boring email, your team can spice things up by delivering customers a love letter (kind of). Give your audience reasons to appreciate your product. 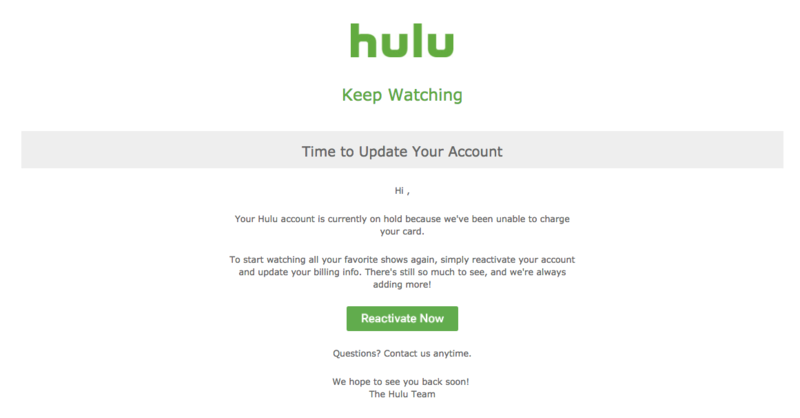 Hulu’s dunning message takes an emotional approach. Coupled with the headline to keep watching, it reminds the customer why they signed up for Hulu in the first place — to enjoy unlimited entertainment and watch their favorite shows on demand. 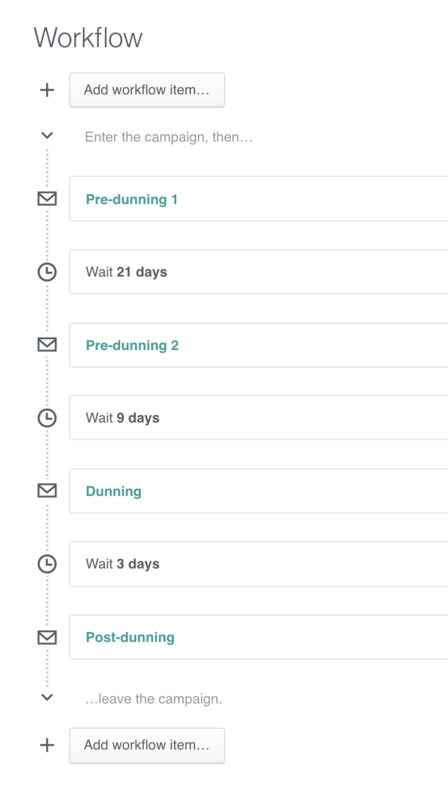 Without urgency, a dunning email fails to satisfy its objective — getting payments on time. Netlify adds an extra push in every element of their messages. The subject line demands the customer’s attention by capitalizing the most important words. The greeting reiterates that action is required by stating: We need your help! The Netlify team also provides the amount of the outstanding balance. More importantly, the customer is given a 10-day deadline to make changes. The risk of losing something makes people realize the value of things. For your company, it’s an opportunity to show customers how much they really want (and need) your product. 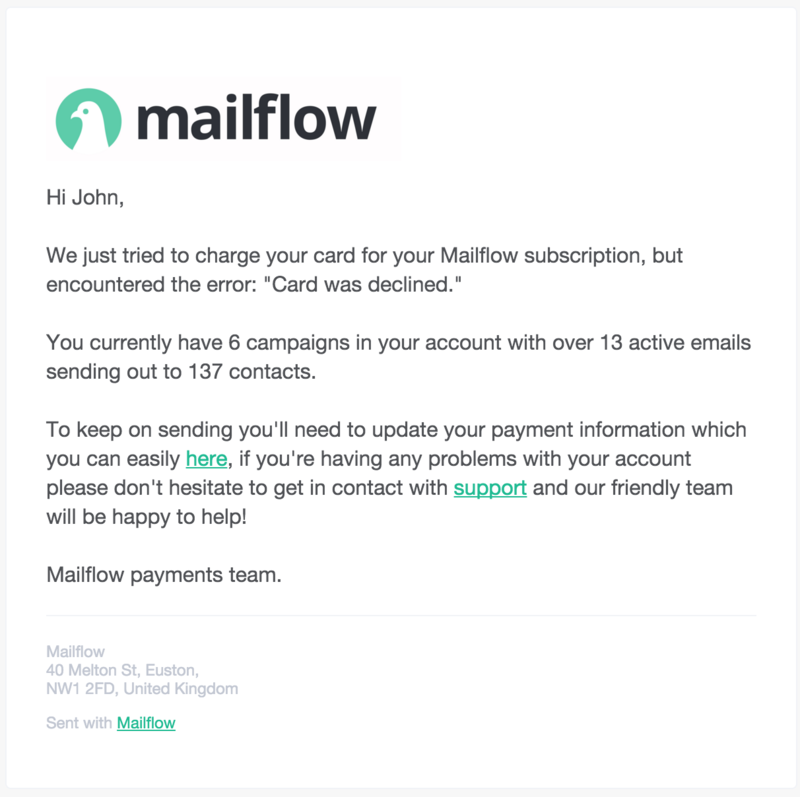 Mailflow’s dunning copy reinforces the idea that a customer relationship exists and that it will be lost if the credit card information isn’t updated. Their team also shows what the customer stands to lose. By mentioning the number of campaigns, emails, and contacts in the subscriber’s account, the message appeals to our natural instinct to protect what we currently own — a cognitive bias known as loss aversion. Payment issues also can signal that a customer needs additional guidance. You want a frictionless process that makes the customers’ lives easier and shows your dedication to a great user experience. BuzzSumo follows its firm subject line with an empathetic and informative message. First, they state the problem and offer a likely explanation for why it happened. 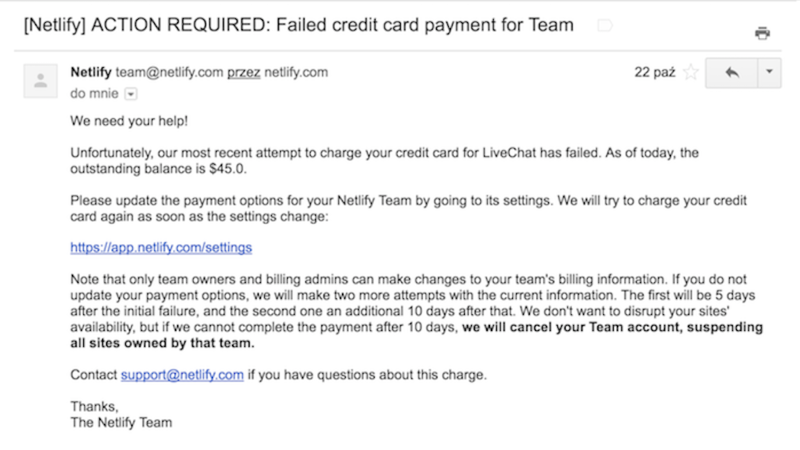 After providing reassurance that they’ll try to charge the card again before canceling, the company ties it all together by thanking the customer and adding an offer for assistance in the footer. After the customer clicks the CTA, continue to be helpful. The billing page should have clear instructions about how to update the credit card information and troubleshoot other issues. A dunning email strategy tackles a pervasive problem in SaaS companies. The solution is to capture customers who didn’t even want to churn in the first place. By connecting with customers before credit card delinquency, you’ll save your team the hassle and boost retention. Plus, you’ll strengthen existing customer relationships.